Even as Instagram passed 700 million users and Amazon rolled out a camera-based Echo that seems tailor-made for fashion-minded influencers on the platform, Fohr Card this week announced a rating system that will let brands see how authentic the following of each of its 15,000 influencers actually is on the service. In December 2014, Instagram said it had purged millions of bots from its network, but the problem has persisted. Just last week, it shut down Instragress, which doled out automated likes and comments for a fee. Still, it didn't claim to have solved the problem of fake accounts. Fohr Card says its own analysis of 20 million Instagram accounts found that 7.8% were bots, which is in line with other estimates. “It's alarmingly easy to buy followers on Instagram. When we were testing and building this product, we bought followers from every service that we could find,” Nord says, paying as little as $200 for 50,000 “followers.” Since the majority of its influencer-sponsored posts is on Instagram, it decided to start there with the idea of moving to additional platforms in the future. It’s a tedious process. Because Instagram limits the number of scans it can do each day, Fohr Card still has a ways to go before everyone in the database has been assigned an Influencer Follower Health score, even after eight weeks of processing. Which is one reason why, Nord posits, no one else has done something similar yet. “You'll see in the screenshot (above), we scored things from a -8 to an 8. From a -8 to a -3, we are saying, ‘we 100% are sure these are fake accounts.’ We are not saying that you bought them because everyone … has a few bots that follow you. That's just the way that bots work. Sometimes they randomly follow people. The bigger the account, the more random bots you are going to have. 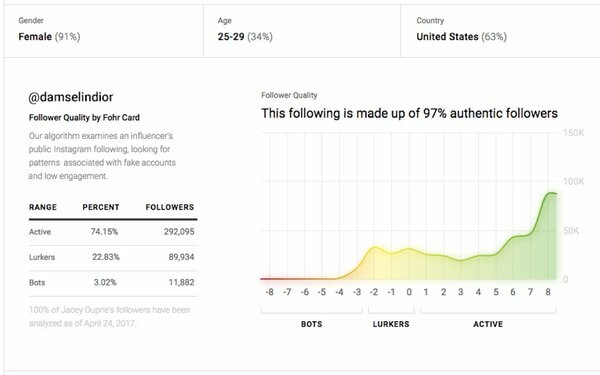 Fohr Card intends to build a tool down the road that will allow its influencers to delete their fake followers. It would also like to start analyzing likes and comments. “It's more that I believe this is a pretty rare practice,” he says, adding that he believes most of Fohr Card’ influencers will feel vindicated once they see their Influencer Follower Health score. On that note, this will be our final Social Media Insider. Thanks to all you readers, commenters and contributors for making it an engaging experience. I’ll see you on social and at the Top of the News. 3 comments about "Rating The Authenticity Of Influencers' Followers". Kenneth Hittel from Ken Hittel, April 27, 2017 at 5:22 p.m.
Really and truly, if you have to descend to buying followers, can you seriously expect to be buying anything but, mostly, bots? Carole Walker from Integrity Marketing & Media LLC, April 28, 2017 at 11:20 a.m. Very sad to learn that this is the last Social Media Insider. Where will MediaPost put social media content of this type in the future? Thom Forbes from T.H. Forbes Co. replied, April 28, 2017 at 2:26 p.m. Thank you, Carole. My colleagues at Social Media & Marketing Daily will be staying on top of things.